The Corps split on Labor Day. Jim and Paul rode bravely through a cold rain to the gates of Yellowstone. 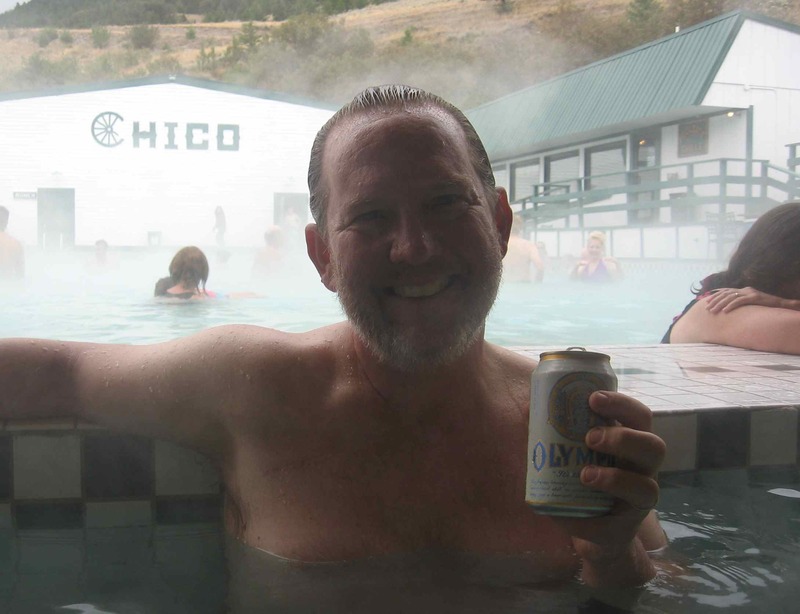 I held back and spent a rest day at Chico Hot Springs. Tania and I saluted Jim and Paul’s bravery by raising cold cans of Olympia while soaking in the 105 degree water. Miners built crude vats to bathe and wash their clothes in the hot springs. In 1876, one of them tapped the 112-degree water and ran it under a greenhouse so he could grow vegetables. Percie and Bill Knowles built the original hotel in 1900; Teddy Roosevelt and Charlie Russell were among the guests ferried in by car from the train station at Emigrant. In 1910, Percie and her son Radbourne re-opened the hotel as a sanitorium under the direction of Dr. George Townsend. By the 1940s the Hot Springs was more of a dude ranch and gambling hall. The present owners have restored the 1900s-style architecture and Craftsman furnishings, and what we saw is a beautiful example of an early 20th century health resort. It’s affordable; a room with shared bath can be had for as little as $49. The restaurant is not cheap but it’s sophisticated, friendly, and has an excellent chef. You can get a massage and ride a horse if you want to, but all we wanted to do was lie around. I will make the ride tomorrow, hopefully after this storm blows through, and Tania will chase me in her rental car; we will all meet at Canyon on Tuesday afternoon. Everyone looked hail and hearty when I caught up with Brad, Sara, Jim and Paul ( who I met for the first time). The split occurred after I picked up Brad happened with his healed bike in the back of my rental: here’s hoping that the Bozeman fix lasts until Cody. 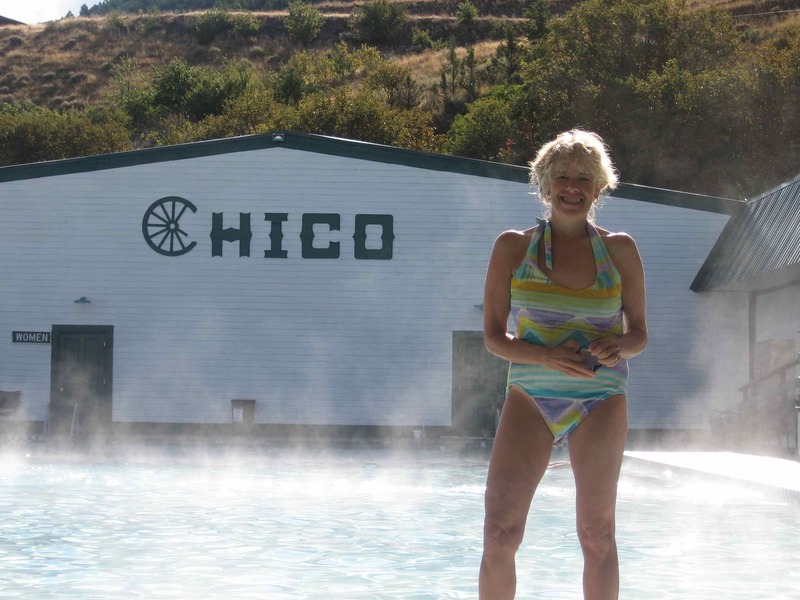 Chico Hot springs is about as good as it gets: late 19th -early 20th century room decor, HOT water under an open sky and comfy room at low prices. In short what we call “good value” (said with a Russian accent). The pix above says it all: the three “B’s”; Brad, beard and beer. Tania, day two at Chico, temp: 40. Guys and Gal, Pat has only today figured out how to get to the comments! Sorry. Here we go. Brad- Your tomatoes were great! Picked some hops too. Tania- No laying in the sun this trip- hope you packed enough warm clothes. Brad- Is the beard going to be trimmed during the trip ? or wait till your home? Keep up the Good Work! Living the hot tub lifestyle. Hi there. I am producing an online magazine and video for my community as a love offering. I am not charging a dime. I’m doing it for the chamber of commerce in Livingston, Montana that also covers Emigrant and Pray, where Chico Hot Springs is located. I found the photo of you with the hot water behind you and would love to use it in the magazine with your permission. Please let me know if I can use it. I would be most happy to send you the link to the magazine when i’ve finished creating it.